Performers include: Kiefer Sutherland, Gugu Mbatha-Raw, David Mazouz, and Danny Glover. This super-natural series follows seemingly unrelated people all over the world whose lives affect each other in ways seen and unseen, known and unknown. 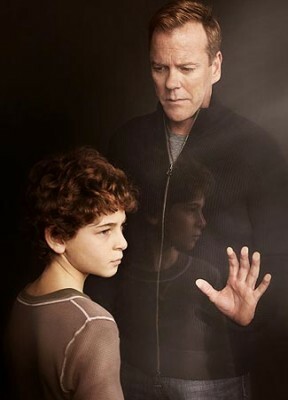 Martin Bohm (Kiefer Sutherland) is a widower and single father whose haunted by an inability to connect to his emotionally challenged 11-year-old son, Jake (David Mazouz). Caring, intelligent, and thoughtful, Martin has tried everything to reach his son. But Jake never speaks, shows little emotion, and never allows himself to be touched by anyone, including his father. Jake is obsessed with numbers and writes long strings of them in his ever-present notebooks and with discarded cell phones. Social worker Clea Hopkins (Gugu Mbatha-Raw) believes that Jake’s needs are too serious for Martin to handle. She sees a man whose life has become dominated by a child he can no longer control. She believes that it’s time for the state to intervene. So, despite Martin’s desperate objections, Jake is placed in foster care. Everything starts to change after Martin meets Arthur Teller (Danny Glover), a professor and an expert on children who possess special gifts when it comes to numbers. Martin learns that Jake possesses an extraordinary gift — the ability to perceive the seemingly hidden patterns that connect every life on the planet. While Martin wants nothing more than to communicate directly with his son, Jake connects to his father through numbers, not words. Martin realizes that it’s his job to decipher these numbers and recognize their meaning. As he puts the pieces together, he will help people across the world connect as their lives intersect according to the patterns Jake has foreseen. Martin’s quest to connect with his son will shape humanity’s destiny. Frantic about the kids, a concussed Martin leaves the hospital with Trevor. He finds Jake’s note in his pocket: 318, the beginning (and end) of the Amelia Sequence. On the dock by a freighter named Leviathan, Aster Corps chief counsel Larry tells Nicole Farington the $40-billion loss will be revealed tomorrow, and it’s the beginning of the end. She says their fortunes will be reversed once the sequence is complete. Tanner the hired thug delivers Jake and Amelia to Farington. Larry’s not joining them on the ship, and she gives him a black backpack to hold onto. Calvin visits his brother, whose health is declining, and promises he’s close to a solution. He joins Farington and Dr. Linus on the Leviathan, where he’s pressured to continue his work, to keep his brother safe. Martin and Trevor find a glove in Martin’s wrecked car and take it to Detective Lange. A fingerprint lifted from inside is tied to five different aliases – but one has a street address of 318. Meanwhile, Avram meets the rabbi in charge, who berates him for meddling with the destiny of the Righteous 36 instead of just observing and reporting. Avram argues that the Covenant of the 36 was meant to grow and change, as humankind has changed, but the rabbi shuts him down. He shows Avram the completed sequence, written in a book chronicling the 36. Now humanity will either move forward, or it’s the end of everything. Either way, Avram won’t be involved, because the rabbi makes him sit in a chair until he learns his place. The 318 address belongs to Tanner, who arrives unexpectedly but is overpowered by Martin – who beats the guy bloody. When Trevor pulls him off, they notice Tanner’s wearing a wire. It’s an insurance policy, proof of his conversations with Farington. In fact, he has a treasure trove of recordings, including one with Farington ordering Tanner to get rid of Lucy. Tanner tells them where the kids are, and Martin calls Lange. Posing as an EPA inspector, Martin boards the ship and shuts down the engines. Despite the danger of inducing coma in the kids, Linus starts the process. Soon Amelia is in distress, and she meets Jake by the pond in her mind. She tells the distraught boy she can’t stay with him anymore and vanishes. The sequence completes, but the real Amelia is flatlining. Martin finds the kids and attacks Linus. Calvin saves Amelia. Martin calls to Farington to turn on the news, and she sees a story about her ordering Lucy killed. The FBI swarms into Larry’s office, and Lange’s troopers board the ship while others arrest Tanner. Calvin goes to William’s care facility, but his brother has died. When Lange comes to arrest him, Calvin sadly says he never meant to hurt anybody. He just wanted his brother back. Amelia’s OK, but she can’t see the probabilities anymore. Martin says she can stay with them until he finds her dad. Later, Avram visits Martin and explains he can’t be involved anymore; it’s not his place. He gives Martin the Tree of Life amulet, saying it wound up with Jake for a reason, just like the cipher. It’s meant to be carried by the protector of the 36. Martin says Jake isn’t even 12 yet. Yes, that’s why Martin should keep the amulet for now. The FBI takes possession of the black backpack, which contains the cipher. It gets shelved in a government evidence warehouse . . . and the wheels start turning. What do you think? Do you like the Touch series? Are you sorry that there won’t be a third season? Touch: Is the FOX Series Worth Watching? yes it was a great series, sad it finished! I need more! I watched both series in 1 day. I really love the show. PLEASE do more. I want a third series. I’m so disappointed that every series I get hooked on, these networks just drop them for reason. I’ve checked the rating and that over 2+million viewers. How much do you consider is enough to keep a show ongoing. Stop dropping that WE consider great entertainment. Just finished watching the series with the family. Everyone was hooked. Don’t understand why there’s so much junk on TV, but they kill the series worth watching. This is one series that could have been a game changer if it was allowed to survive. Very disappointing. I think it was cancelled because it made to many people have to think. Im so tired of getting hooked on a series and it getting canceled. Touch is a great series. Please bring it back. So disappointed they cancelled the show. Typical TV station. Stupid reality TV for the stupid masses gets saved and excellent programming like Touch are cancelled because it’s too “complicated” for the average IQ of viewers. Figures. Go back to watching Honey Boo Boo America, that’s apparently all you’re smart enough to handle. LMBO I couldn’t agree more. Can’t believe that fox cancelled this show over all the other horrible reality crap that is on. My sons and I couldn’t wait for this season. Seriously disappointed!! !